The first stores selling patriotic clothing in Poland opened doors nearly 10 years ago. Today, everyone is wearing it: from the Polish president Andrzej Duda to school children. Parents and their kids put them on for patriotic marches. 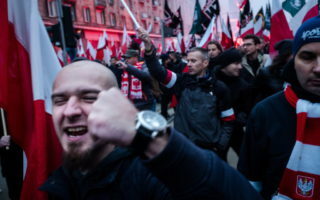 Warsaw, 11 November 2018, March of Independence. Over two hundred thousand people are marching through the streets of the capital. 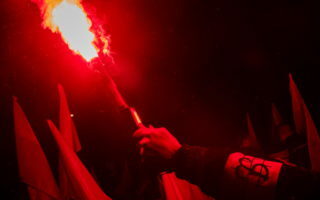 Flares are burning and you can hear people shout: ‘White Poland’ and ‘Poland can’t be red or rainbow, Poland must be nationalist’. 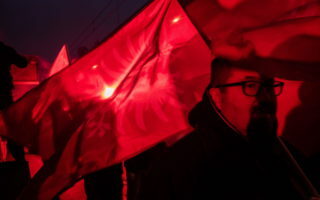 The marchers are wearing white and red colors and T-shirts with national symbols. Plus: armbands with a symbol of the 1944 Warsaw Uprising against the Germans, T-shirts with the image of a Hussar – a Polish winged cavalry rider from the 17th century, pouches and backpacks with the symbol of the National Armed Forces, a right-wing unit from World War II. Slogans on T-shirts: ‘Proud of our origin since we were born’, ‘Anticommunists’, ‘Defenders of Europe’, ‘Death to enemies of the homeland’. Among the many banners, some catch the eye more than others. 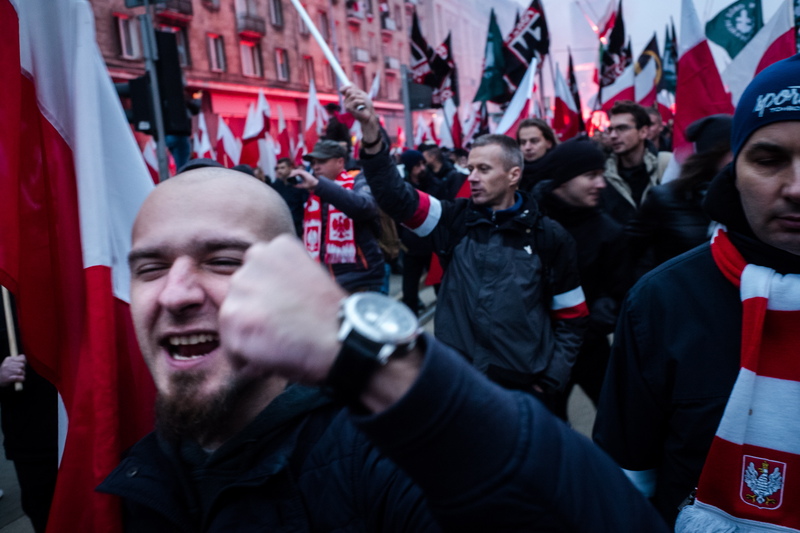 Their photos have gone around the media: ‘White Europe of brotherly nations’, ‘Pure blood, sober mind’ and ‘Europe will be white, or it will be deserted’. 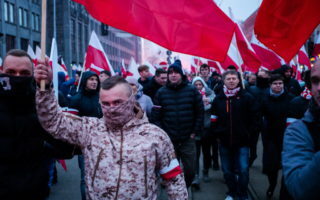 Demonstrators shop for outfits for the march with the biggest makers of patriotic clothing in Poland, whose profits reach millions of zlotys: Red is Bad, Surge Polonia and Pro Patriae. One of them, Pro Patriae, donates income from the sales of T-shirts prepared specially for the March of Independence to the association organising the event. 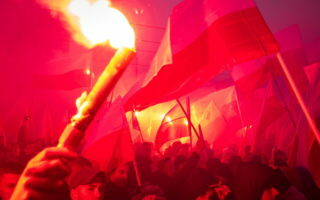 Their white and red brand (referring to Poland’s national colours) has been a magnet for patriotic customers for many years. 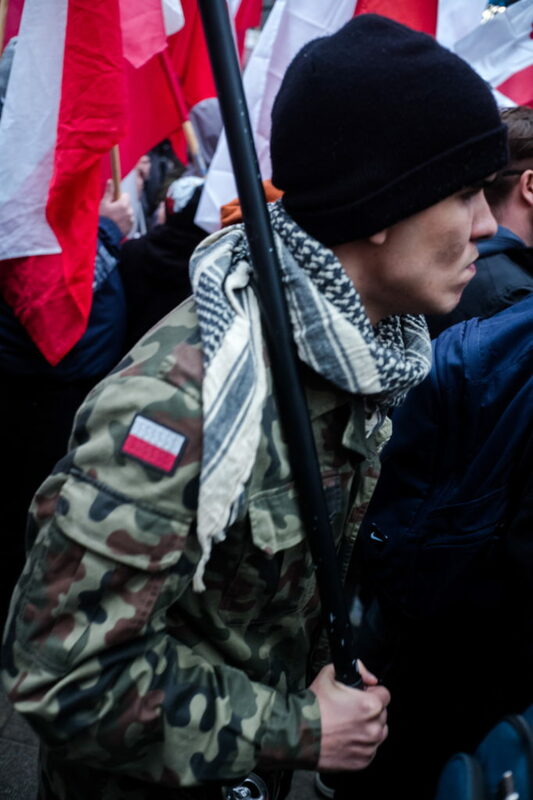 Fashion for T-shirts with an eagle from Poland’s national emblem is doing well. 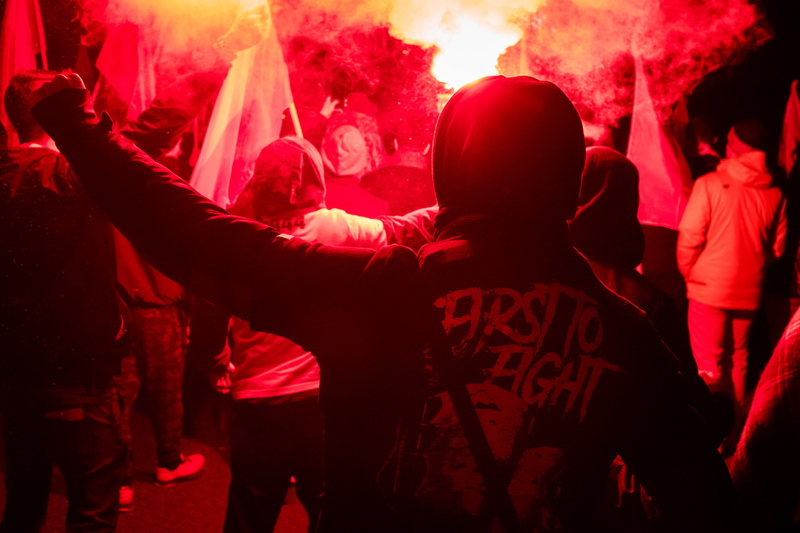 Coming from sports stadiums and nationalist demonstrations, patriotic T-shirts have now reached a wider audience. 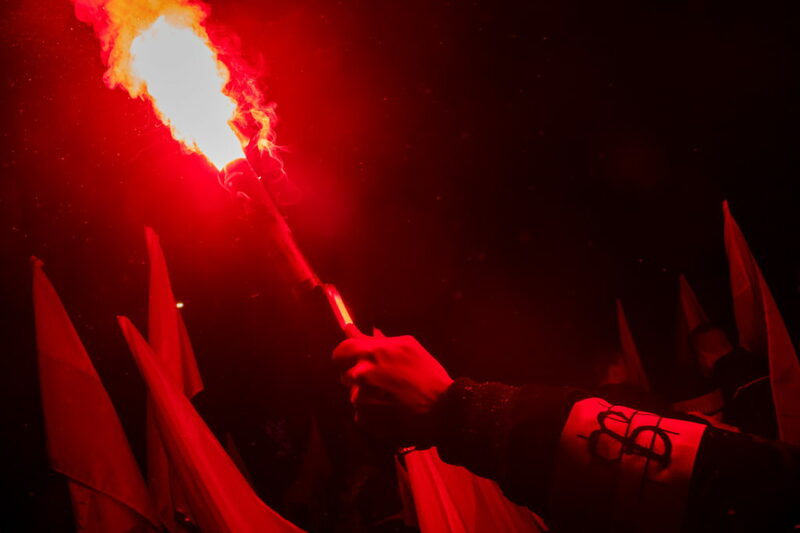 For Independence Day, anniversaries of the Warsaw Uprising and other historical events, the online shops with patriotic clothing are stormed, and retailers reap the richest harvest. Sales can even double. Prices of the products are high, and the reason given is their high quality. Business owners require their clothing contractors to meet the following conditions: the product must be designed and made in Poland, with good quality materials and by Polish tailors. 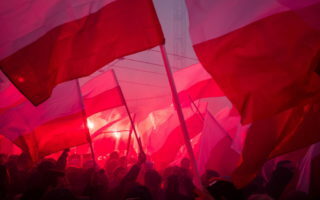 Red is Bad, the biggest manufacturer of patriotic clothing in Poland, has a manifest about that: ‘We make our clothes in Poland. It is extremely important to us. We make every effort to ensure all components of RED IS BAD products are made in our country. Fabrics, labels, zippers, leather items, strings, tabs, print paints… – all this is made at home’. At home means that it is not made in a factory in China or Turkey. And most importantly – with no EU funding. 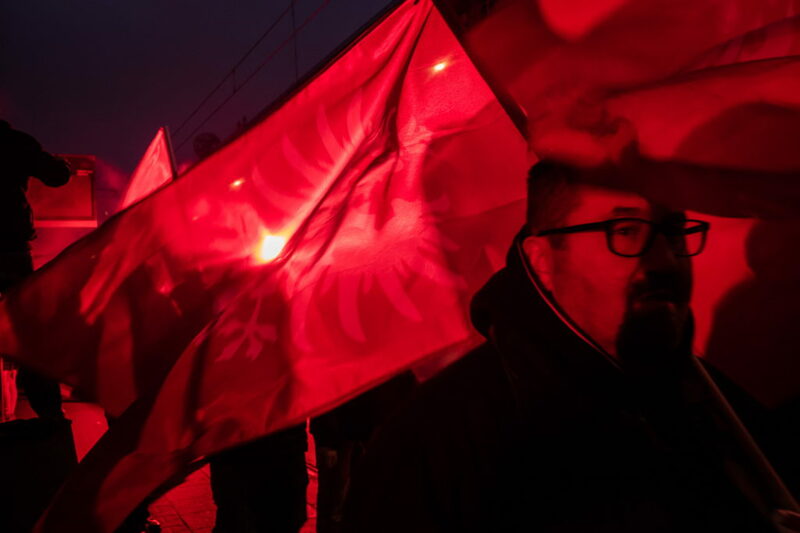 ‘We have always emphasized that the entire project has been developed without any EU funding and has not been supported by a wealthy investor’ the people behind Red is Bad write in their manifest. Paweł Szopa and Jakub Iwański, the company’s founders, are friends from secondary school. In the school years, they were brought together by their aversion to the EU. When one of them started studying law, and the other one design at the Academy of Fine Arts in Warsaw, they kept in touch – mainly on occasions when Iwański published graphics conveying a very conservative message on his social media profile. 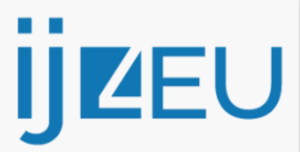 Szopa, who had grown up surrounded by right-wing worldviews, as he explains, came up with the idea to create a Facebook profile with those graphics. It featured memes criticizing the government. and picture stories about events from Polish history. Then, as their website began to gain popularity, someone suggested ‘Why not make T-shirts with the artwork from your profile?’ From then on, the business got going. Since then the company has been growing stronger every year – it is moving from an online store to the real world. In 2016, it opened brick and mortar shops in the centre of Kraków and in Warsaw. Red is Bad has good PR. President Andrzej Duda wore their T-shirt during his travel to China in 2015. Prime minister Mateusz Morawiecki visitsed a Red is Bad store in Warsaw in 2018. He took reporters with him: the photos and videos of his shopping at Red is Bad made it to the top of online portals. The prime minister donated 50 T-shirts to Polish scouts. Also politicians of the political party Kukiz’15 like to wear Red is Bad T-shirts, including their leader and musician Paweł Kukiz. Why did they call their brand Red is Bad? 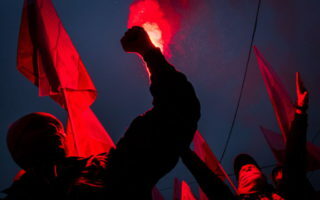 ‘The word “red” does not only refer to the Soviet Union and communism. We also mean post-communism. This is a very broad term. By saying “Red is Bad” we oppose the enslavement of the individual, a system in which the life of most people is limited to working like a horse, eating fast food and sleeping. In our manifests and designs we criticize the European Union in its current form’ explains Paweł Szopa in an interview for Gazeta Wyborcza. As you review the product range of online shops selling patriotic clothes, their promotion is no different from that of any other kind of fashion. You have models, occasional special offers and photo shoots on Instagram. Smiling, proud young people are keen to have photos taken wearing T-shirts with historical dates and the images of national heroes. They then post them on social media. 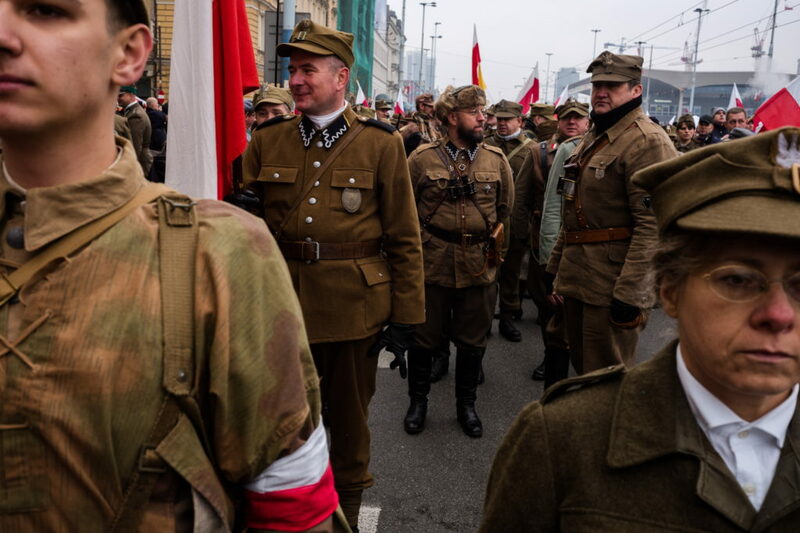 The clothing companies prepare outfits for every occasion, and the occasions are many: March – Cursed Soldiers Day, June – tribute to Captain Pilecki, August – Warsaw Uprising, September – outbreak of World War II and the Soviet aggression on Poland, then November – anniversary of Polish independence. But there are even more historical events and themes used by patriotic clothing designers. Victorious battles from the Middle Ages and events from 1,000 years before also land on T-shirts, sweatshirts, jackets and hats. There are also patriotic rompers for babies, and patriotic leashes and caps for children. Lingerie, belts, bags and mugs. 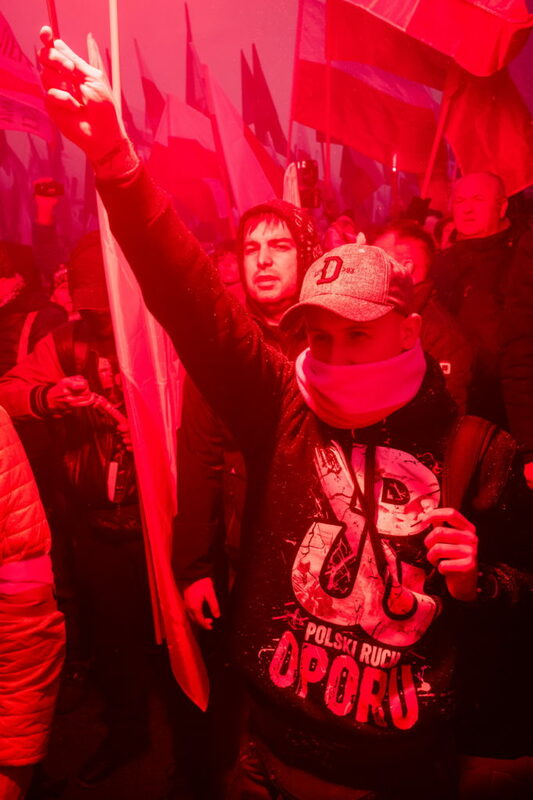 Every T-shirt has a rich description: when you shop for a shirt with the anchor – a Fighting Poland symbol used by fighters of the Warsaw Uprising in 1944, you can learn about the history of the sign from Red is Bad website: where it came from and who used it. 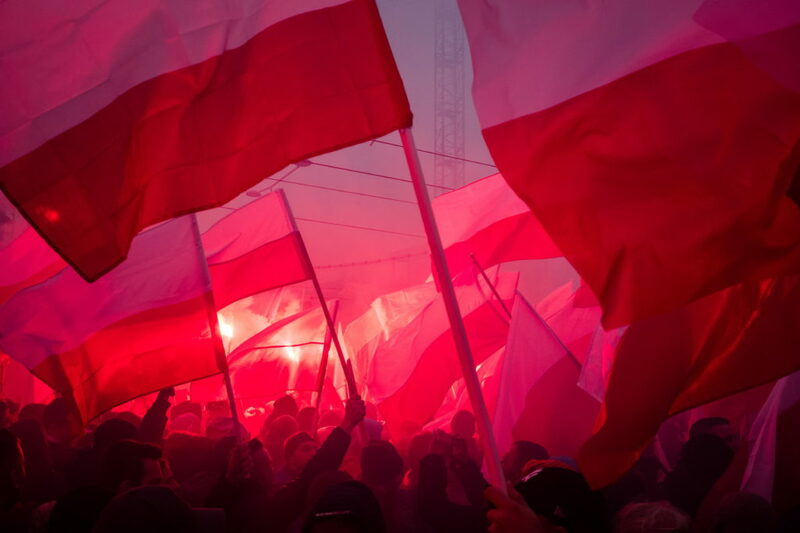 Surge Polonia (Rise Poland) was established in 2011 in Wrocław, and Wojciech Setny and Mateusz Staroń picked November 11th, the Independence Day, as the commencement date of their business. They started out as a start-up, and their only distribution channel was online. 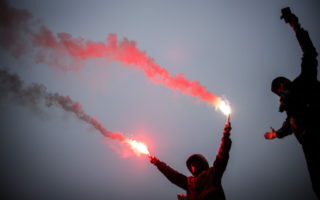 When in 2012 Poland hosted the European Football Championship, the young businessmen set up a stall near the National Stadium before one of the matches of the Polish team. The interest in their T-shirts exceeded their expectations. Since then, their sales show no sign of waning. Their shirts are worn by sports stars and businessmen. In an interview for a business portal bankier.pl, Staroń and Setny said: ‘We have more and more custom projects, made to individual order. 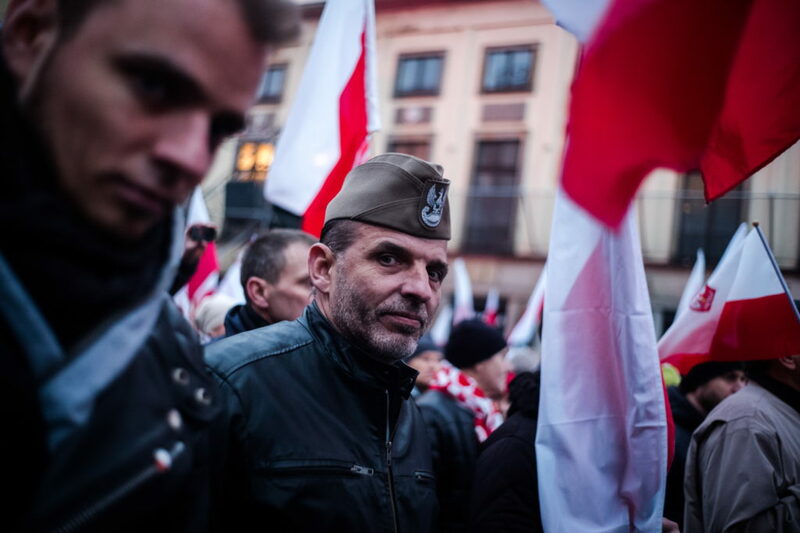 For example, the 6th Airborne Brigade from Bielsko-Biała once ordered a shirt for the famous basketball player Marcin Gortat, who ran his basketball camp in that town. Also the national bank PKO BP ordered dedicated shirts from us. Now, specially for the bank’s President Wojciech Jagiełło, we have designed a T-shirt with king Władysław Jagiełło with his knights, and the motto: ‘The name obliges – Grunwald 1410’ (the Battle of Grunwald was a victorious battle against German–Prussian Teutonic Knights – VSquare). 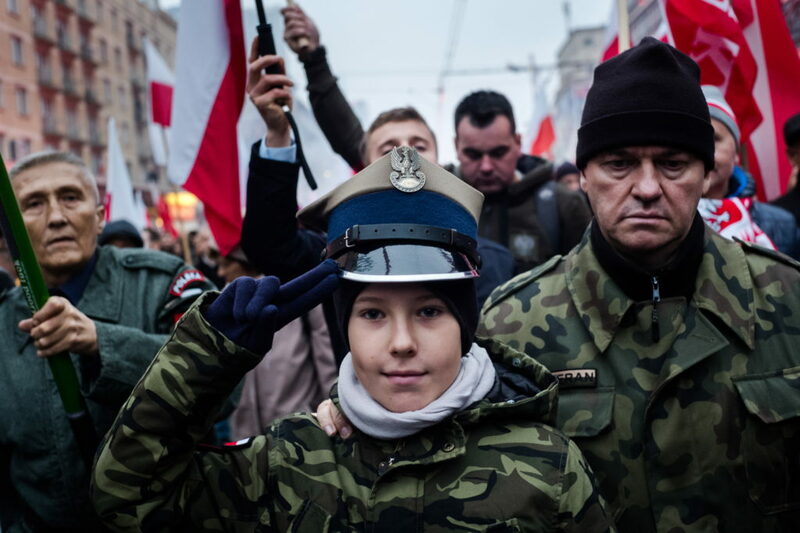 Surge Polonia also offers military jackets, sweatshirts and even business shirts. Why did Staroń and Setny open a patriotic business? 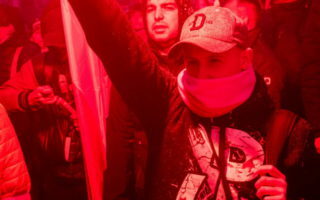 ‘We wanted to manifest our commitment to our country and to make history, shut away in academic books, become a part of our everyday experience’ said Staroń in an interview for historia.org. Patriotic business is not always a success story. Some Polish clothing brands have tried to go with the times and add such clothing to their product ranges. They suffered a defeat. Próchnik – one of the oldest Polish companies listed on the stock exchange filed for bankruptcy in June 2018. It was killed by a change of business model: from a clothing company with traditions to a patriotic clothing company. Following in the wake of Red is Bad, Próchnik moved its clothing production from China to Poland. 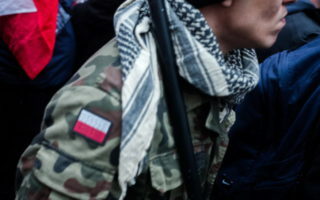 A patriotic theme was woven into the company’s logo and T-shirts with Polish war heroes were added to the product range. This was a shot in the foot for the business. ‘The real image of Próchnik as a quality fashion brand and an undisputed leader in outer garments for many decades, deep-rooted in Poland, was abandoned. 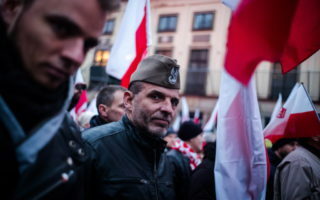 Its place was taken by a turn towards historical, patriotic and military motifs, unconnected with the product’ wrote Próchnik representatives in a message, as they declared the company bankrupt. ‘People love to express their emotions. And today, through fashion, you can express your patriotism. 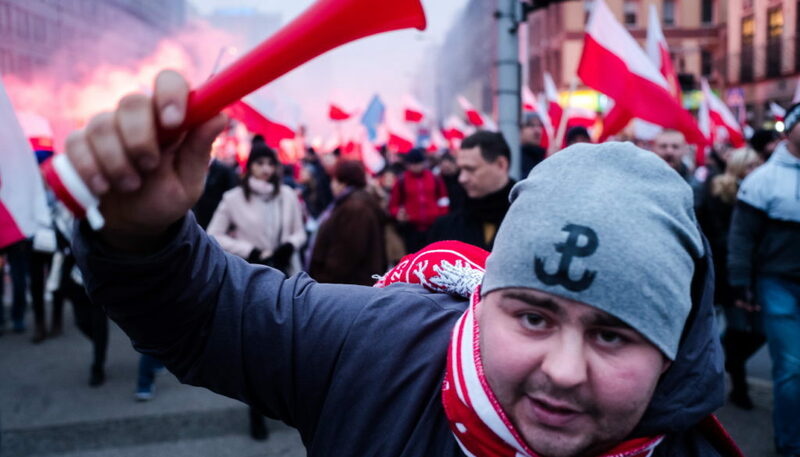 Our customers define themselves through attachment to patriotism’ says Mateusz Staroń, the owner of Surge Polonia. This is how Barbara Mróz-Gorgoń, PhD and Assistant Professor in the Department of Basic Marketing of the Wrocław University of Economics, author of the book ‘The National Symbolism of Clothing as a Manifestation of Patriotic Values – a Case Study of Patriotic Clothing Brands’ explains the rise of the fashion for patriotic clothing in Poland: ‘We have a historically rooted passion for parading our patriotism. And emphasizing that we are unique compared to other nations. When you add to this the 1990s in Poland, shortly after the fall of communism, a time that instilled entrepreneurial spirit in us and sparked the need to finally own something, eg. 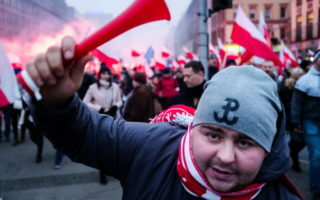 your own, Polish business, and when you take, on top of that, the young generation’s aversion to the European Union and immigrants, what you get is a ready base for the rise of both the target group, and the makers of patriotic clothing’ – explains the expert. ’On the one hand, the most successful makers of patriotic clothing, and these are mostly young, educated people, emphasize their attachment to patriotism and talk a lot about history and ancestors. However, as they are aware of marketing mechanisms, they just operationalized what they saw around them in a purely business manner. Put simply – they found a gap on the market and they effectively filled it’, concludes Mróz-Gorgoń. The marketing specialist predicts that interest in patriotic clothes will continue to grow. 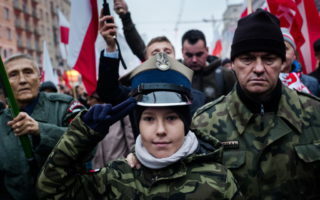 ‘Polish young people today are bombarded with patriotic contents and fed history from under the banner of the Hussars and the great victories of the Polish army. One can therefore predict that, in a few years, when the young people enter into adulthood, they will still want to show strong attachment to patriotism and flaunt it around. They will also pass it on to their children. This climate is not going to change so fast,’ she convinces. 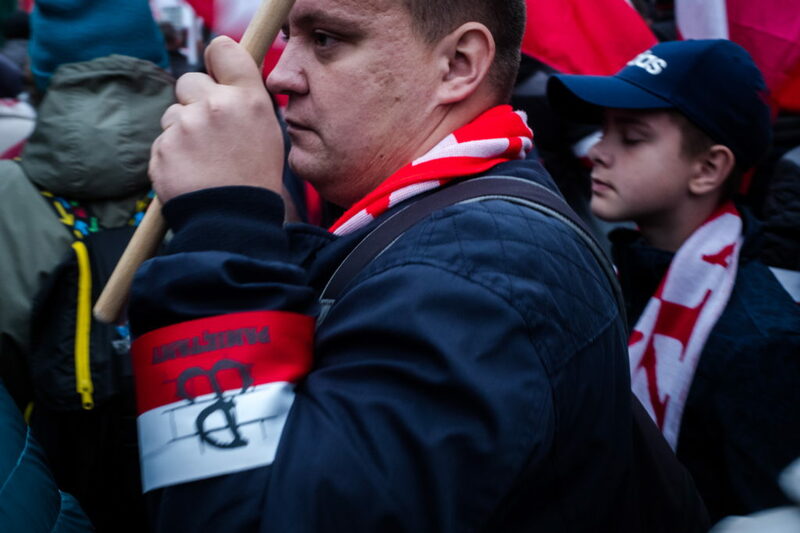 Marcin Murzyn owns one of the oldest businesses selling patriotic clothing in Poland. The website Ultrapatriot.pl was created in 2009 in Olsztyn, and the owners of the store are preparing to celebrate a round anniversary. How is the patriotic business doing? ‘In 2009 there was no fashion for patriotic clothing and there isn’t one now. If you wore an eagle in 2009, they took you for an extreme right-winger. Fortunately, this has changed now. But I don’t look at it in terms of fashion. You simply either are a patriot, or you are not,’ says Marcin Murzyn. And he adds that he has noticed the market is satiated with patriotic products. There are fewer buyers than in previous years. ‘We have the comfort of being a family company, and patriotic clothing is only a part of our business. We make customized clothes ourselves: for associations and for the fans. 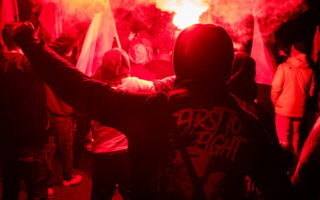 We’re going to do it, even when the so-called fashion ends’ says Murzyn strongly. 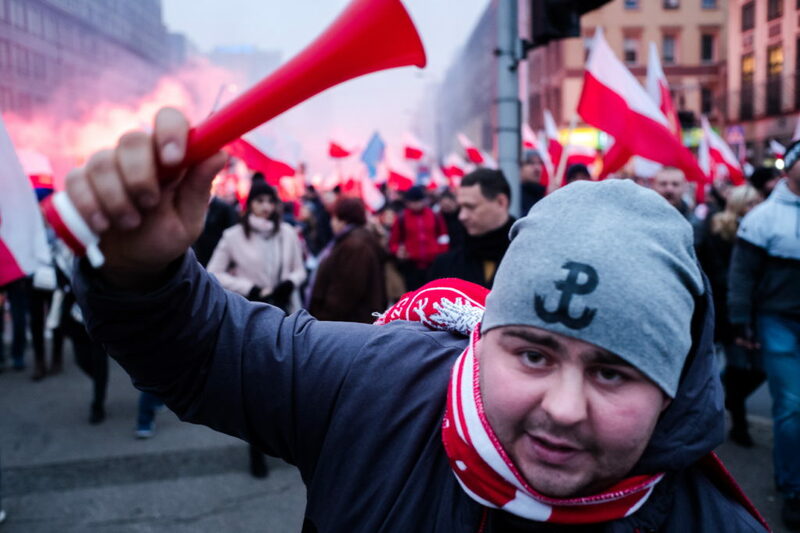 Polish journalist, reporter at Superwizjer TVN, since 2016 working with Fundacja Reporterów (Reporters Foundation), in 2016 shortlisted for Grand Press award. 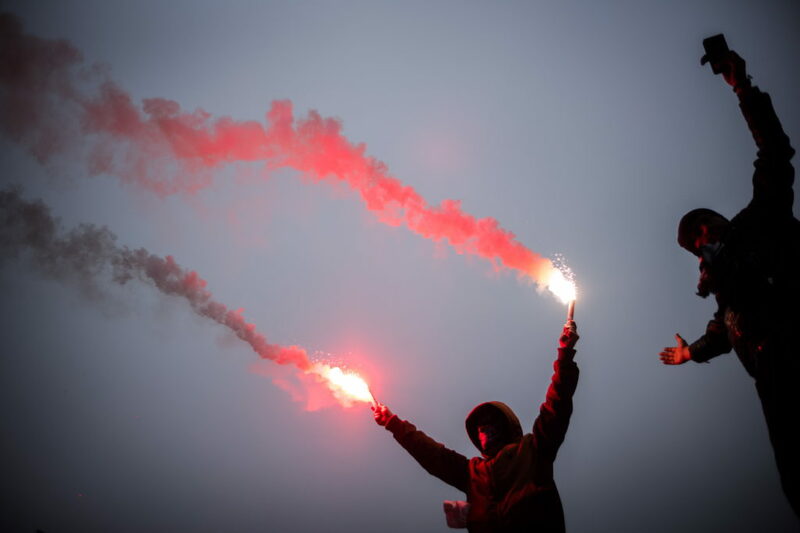 Based in Warsaw.